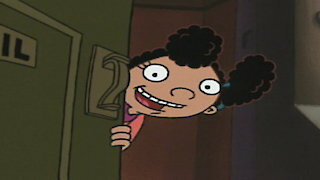 When Gerald tries to get rid of his little sister Timberly, Arnold sticks up for her by persuading Gerald to let her hang out with them. Mr. Leichliter, the theater critic, posts auditions for his rendition of the classic play, "Eugene, Eugene." Hey Arnold!, Season 5 Episode 28, is currently available to watch and stream on Nickelodeon. You can also buy, rent Hey Arnold! on demand at Amazon, Hulu, Vudu, Google Play, iTunes online.